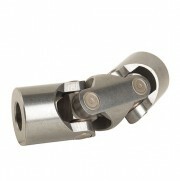 With Needle bearings inside the universal joint instead of a standard pin and block assembly, this type of universal joint is capable of much higher speeds than a standard universal joint. The Mario Ferri Needle Bearing universal joint is a very versatile universal joint with a maximum speed of 4000RPM and a maximum angle 45º f thestandard universal joint. 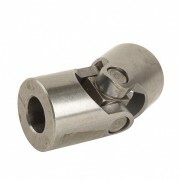 Designed with high quality, pre-lubricated and sealed needle bearings, this universal joint provides the reliability necessary for speeds up to 6000 RPM, and operating angles up to 25°. Needle bearing universal joints also ensure the precision required for robotics, instrumentation, control equipment, and many other demanding applications. 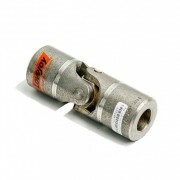 It is available assembled with both no bore or with a pilot bore. Protective rubber boots are available to ensure proper lubrication for up to five times longer universal joint life.